Analysis of microarray, SNPs, proteomics, and other high-throughput (OMICs) data is challenging because of its biological complexity and high level of technical and biological noise. One way to deal with both problems is to perform analysis with a high-fidelity annotated knowledge base of protein interactions, pathways, and functional ontologies. This knowledge base has to be structured in a computer-readable format and must include software tools for managing experimental data, analysis, and reporting. Here we present MetaDiscovery, an integrated platform for functional data analysis which is being developed at GeneGo for the past 8 years. On the content side, MetaDiscovery encompasses a comprehensive database of protein interactions of different types, pathways, network models and 10 functional ontologies covering human, mouse, and rat proteins. 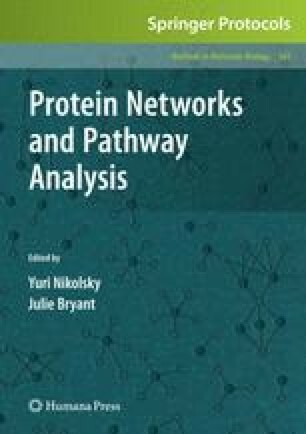 The analytical toolkit includes tools for gene/protein list enrichment analysis, statistical “interactome” tool for identification of over- and under-connected proteins in the data set, and a network module made up of network generation algorithms and filters. The suite also features MetaSearch, an application for combinatorial search of the database content, as well as a Java-based tool called MapEditor for drawing and editing custom pathway maps. Applications of MetaDiscovery include identification of potential biomarkers and drug targets, pathway hypothesis generation, analysis of biological effects for novel small molecule compounds, and clinical applications (analysis of large cohorts of patients and translational and personalized medicine).